The Cambridge Keyboard Festival that took place at Jesus and Wolfson Colleges on 19-20 March was devised and directed by Fitzwilliam music Fellow Francis Knights. 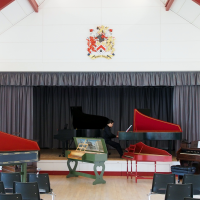 The Festival featured 11 separate recitals on piano, organ, chamber organ, harmonium, accordion, harpsichord, virginals, spinet and clavichord, covering music from the 16th century to the present day, with a focus on Bach. The performers included Francis Knights (clavichord) and former Fitz organ scholar Will Warns (harmonium).